I have so many projects on the go it is somewhat intimidating. Fabric and dress patterns galore. Enough to fill the next 2 months of 'free' time. 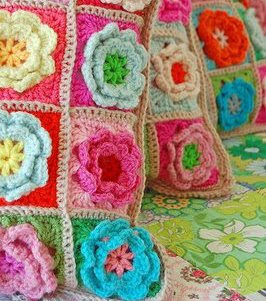 So why, oh why, this sudden urge to crochet granny squares??? Is it about the colors? Maybe I miss going to the yarn shop and drooling over bright, juicy, sunny balls of yarn? 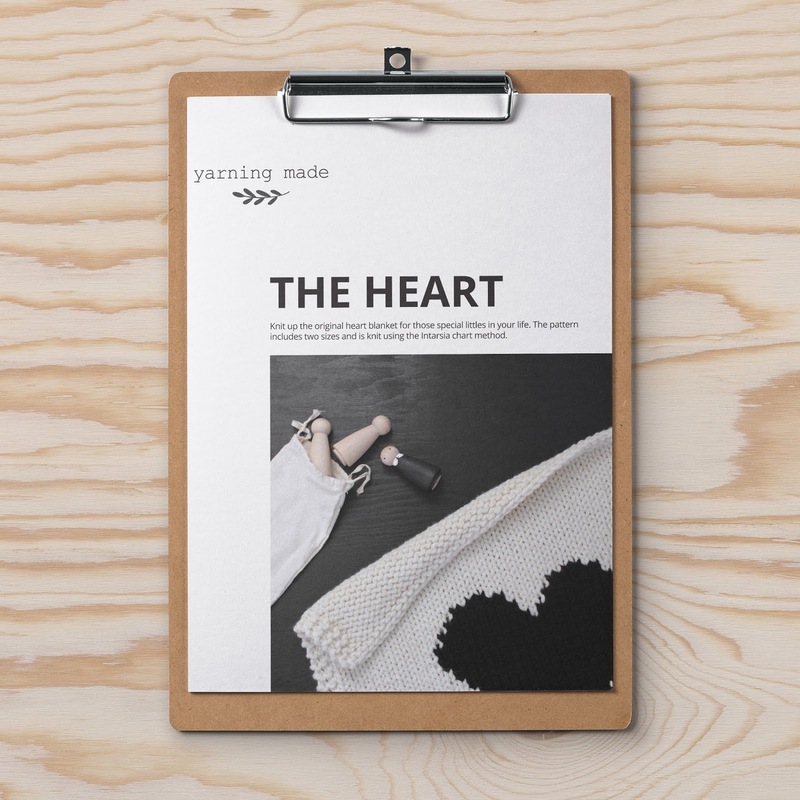 Is it knowing that one granny square can be crocheted anywhere, anytime, and in 15 min flat? 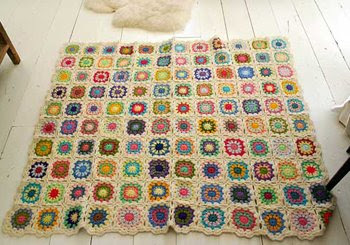 (I am pushing the whole weaving in of ends to the back of my mind, I loathe that part) Anyhow, I love granny squares. I may not have the patience for a blanket, but perhaps a purse? A pillow? 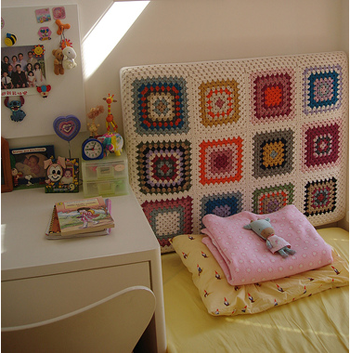 The blanket above is from Yvestown's Flickr stream. The image below is from HeyHome. 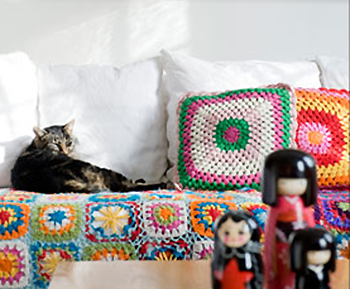 The blanket below is from Sarah London. 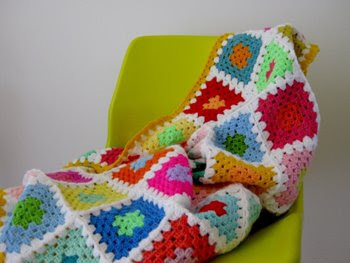 Check out her great granny square tutorials on Flickr. I love the headboard idea below from Little Purl of the Orient. 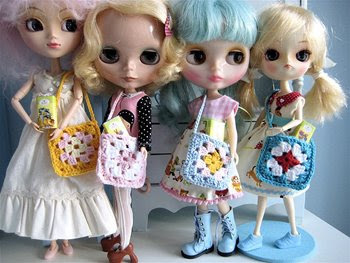 My daughter is a huge Blythe fan, so had to include the adorable tiny Blythe purses below by Moline and available on her Etsy shop. The pillows below are just too delicious. The colors!!! From Rose Hip. 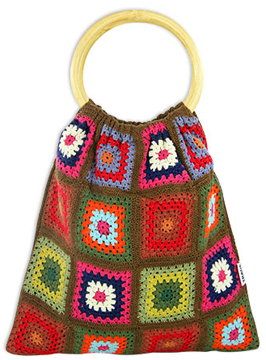 Groovy Granny Square Tote available here. I like. Hi girl, guess what I found downstairs in the storage are, from the seventies I still kept SPELEN MET RESTEN, and in it from 3 Suisses yarn company, a crochet squares plaid (or blanket), pillows, a bikini (yes a bikini crochet), can you see yourself??????? 70'ties hats, socks, doll clothin, (3 blankets from squares) bottlewarmers, pannelappen, teacozy, so girl, are you interested, do you want me to send it to you, in dutch however, love mom. Yes please!!! I would LOVE that! :) Thanks Mom! !